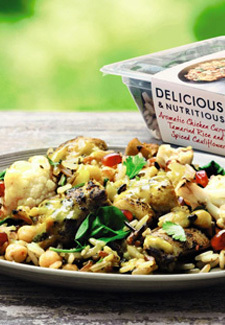 Take your pick of 3 meals from the Delicious & Nutritious range and get the cheapest one free. With the most expensive meal costing £4.49, there’s almost £5 worth of savings in this foodie offer. With the dishes drawing inspiration from Middle Eastern flavours, why not use your freebie as a chance to give something new a try? Go for Paprika Rubbed Chicken with Turkish Spiced Ratatouille, Chickpeas and Soured Cream. Or perhaps fish dishes are more your thing – we bet you haven’t tried it like this before; Harissa Spiced Scottish Salmon is cooked in pink grapefruit juice with edamame, spinach and cranberries. Whichever dinners you opt for, you’ll be getting 2 of your 5 a day from the freshest ingredients, exotic spices and nutritious grains and pulses. Offer ends May 6th – enjoy!